Our popular "Gelling Varnishes" have been supplied to practicing oil painters since 1999. 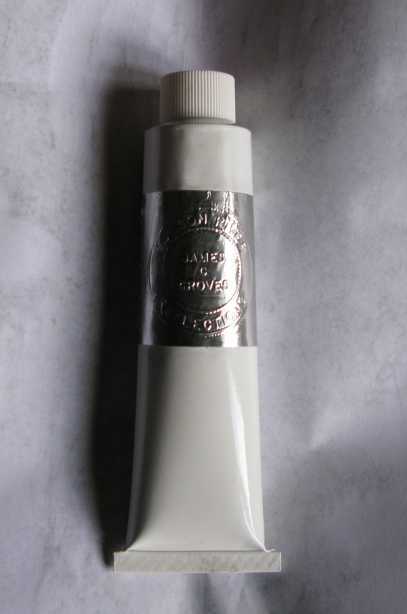 These excellent and unique varnishes were heretofore only produced in a liquid form, which necessitated being mixed or "rubbed up" with an oil just before use. The created jelly could be stored for short periods before it slumped or separated; however, there was no real shelf-life. After many years of experimentation I succeeded in creating the jelly in such manner that it could be pre-made then stored as a jelly within a tube; thus, "Copal Jelly" was created. 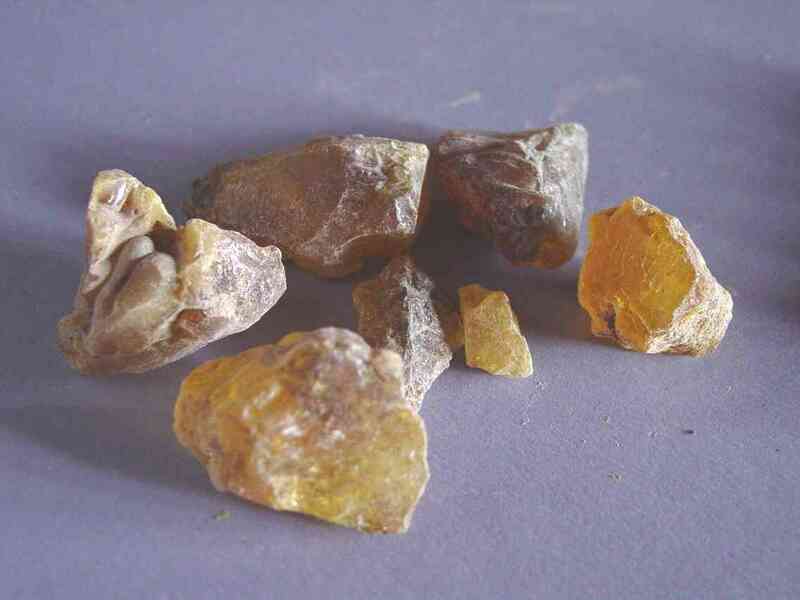 Copal jelly has the same ingredients and nothing more than the original "Gelling Copal Varnish". It contains only the following ingredients: Copal resin, a common but heat-processed painting oil, a small amount of turpentine (so very little that my own nose cannot detect its presense), and lead. The secret to having it all "gel" lies with the method and manner of the cooking-process. There is no mastic, fumed silica, wax, or anything else in the formula than the four materials cited. Copal Jelly thickens and transparentizes home-made or commercial 'tube' paints. The treated paint will dry in about 12-24 hours and retain every stroke created. The jelly may be added to paints in any desired proportion, though it is formulated especially to be used in equal amounts or less to the paint. Equal amounts only applies to the colors; "whites" can handle much less-- a half-amount being excellent. Copal Jelly is meant to extend and transparentize the colors --so necessary to a layering approach. That mentioned, Copal Jelly also allows the creation of excellent impasto; and is ideal for use in an alla prima manner. Copal Jelly is perfect for use with true asphaltum paint. Like Origin and Fir Wax, Copal Jelly allows the fine transparent brown to keep its place and dry perfectly. As far as I know, true asphaltum is not currently offered by any artist's paint company, which is a shame because there is no finer means for sketching or laying-in the monochrome or chiaroscouro. DeMayerne gave instruction for the creation of the typical 1600's asphaltum -- a brown conjured from a solid glass-y rock; which has suffered great condemnation in the many years since. According to my own tests (and MOLART's tests), asphaltum is a permanent and non-hazardous transparent brown when formulated and applied correctly. The true culprits are the similar and supposedly "safe" browns known variously as Cassel earth, Cologne earth, Vandyke brown and Rubens brown. These similar browns all contain humis, which is the forever-plastic matter that causes eventual movement within the paint-layer. Ditto the tempting brown known as bitumin; and also 'mummy brown', a color based upon bitumin, which was utilized to impregnate and seal the mummy wrappings. (Realize, bitumin is tar, a substance that never dries.). I have been making true oil or spirit asphaltum paint for some fellow painters for several years, now. I currently offer 40 mil. tubes of the true and well-behaved 1600's asphaltum oil paint on this site. I have tested asphaltum oil paint with both Roberson's Medium and the Copal Jelly. Both do work well, though the Copal Jelly offers the best retention of the stroke and the least 'drying slump'--especially when using the solvent-technique. The image above shows asphaltum straight from the tube (left); asphaltum combined with Copal Jelly (middle); and asphaltum combined with Roberson's Medium (right). All samples have dried. Note the vivacity of the brushstroke incurred via the use of the jelly-additions. 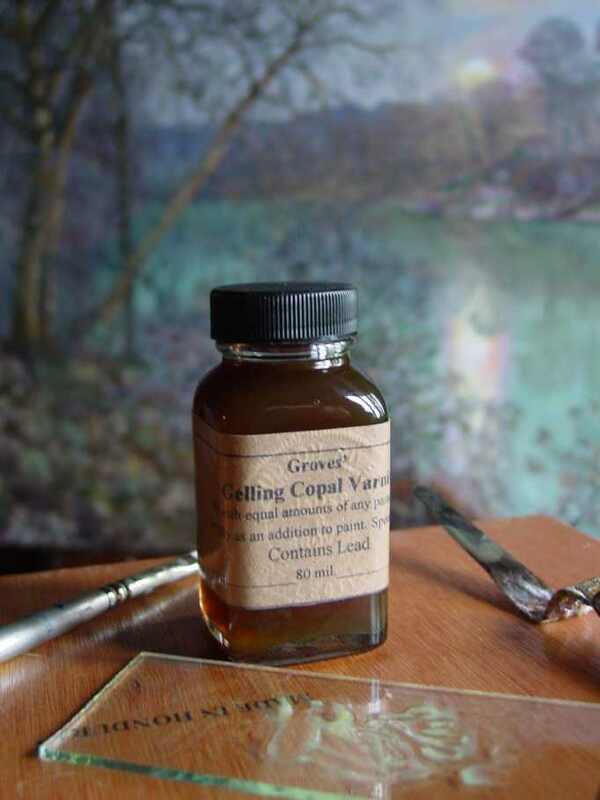 Gelling Copal Varnish - This varnish contains copal, turpentine, and walnut oil. The fast-drying version also contains a metallic-based (lead and manganese) drier. We recommend mixing this varnish with un-refined walnut oil when making a painting 'jelly' medium; or the varnish can be mixed directly with the paints on the palette, congealing them, so that they then require a solvent (such as turps, mineral spirits, spike, lavender, or Rosemary) for actual painting ( my own preferred method of painting). 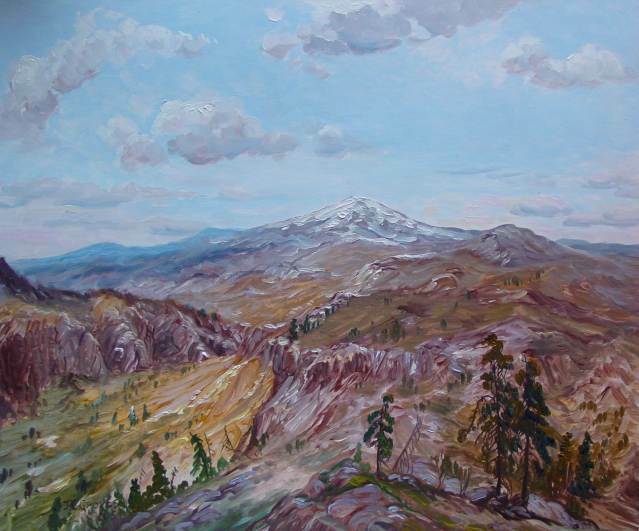 GCV without the metallic (manganese and lead) drier allows extended working times, several days, but may be quickly 'pushed' to become dry by placing the work in direct sunlight for an hour; afterwards, the painting can be returned to the studio, whereupon it will likely be dried in about 12 hours or less. Of course, adding a drop of any chosen siccative (drier) to the paint, or using a 'drying oil' (such as "black oil") to create a painting 'jelly', will allow fast-drying, too. 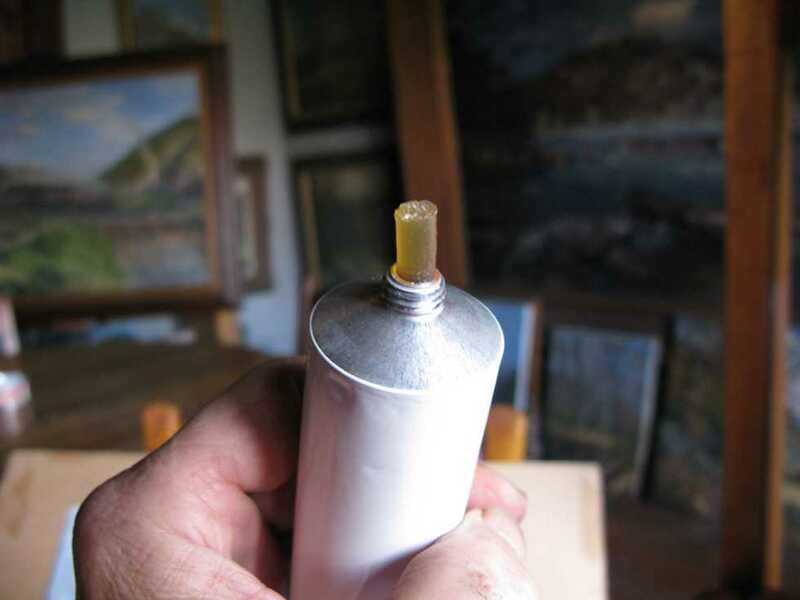 For use in a solvent painting technique: Simply dip the clean knife or a brush handle into the jar of CGV and allow two or three (or more) drops to land on each paint nut. I recommend about three drops per nut. Use the knife to work the GCV into the paints, creating a congealed mixture. Then add a few drops of any chosen solvent and remix the paint into a supple amazingly facile texture, allowing brushwork effects obtainable in no other way. There is never a need for 'oiling-out' when using this solvent-added technique. The paint is further thinned for required uses (such as thin lines, tree branches) by lightly dipping the brush into a handy solvent while painting. This method works quite well with handmade paints, especially those that are slump-y. In fact, it is generally recommended to rub-up the freshly-made paints to a thin-cream consistency for best results when using congealing varnishes. Any paint-effect observed in the works of the olden masters, as well as up and into the 19th Century, can be hand in this fashion, which is through the use of a powerful congealing ('gelling') varnish. 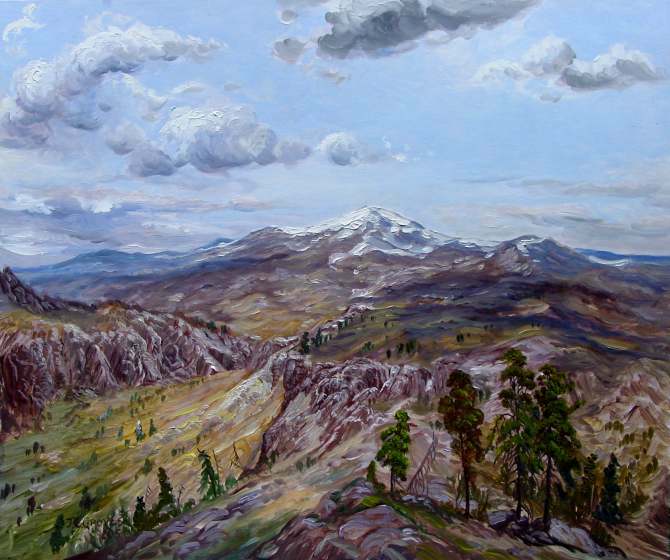 For use in an all-oil-no-solvent painting technique: Many oil painters today have moved away from solvent-use, preferring instead an all-oil methodology in the creation of their work. Our amber, sandarac, and copal "gelling varnishes" work well with the all-oil manner. GCV combined with any painting oil creates a gel medium that strengthens oil paint and allows manipulation unavailable with non-gelling varnishes or straight oil-and-pigment paint. If the GCV contains a drier, its use with the paint also speeds drying (generally overnight). Additionally, using GCV increases color-saturation and optical qualities in the work. Unlike megilp, no leaded drying oil (AKA "black oil") is required to mix with this pure copal varnish. Everything essential to gel-formation is already contained within this varnish. Just add an equal or double-amount of any oil desired and, voila, a pale translucent jelly medium is born. This 'copal jelly' couples a long open time with truly exquisite brushing and manipulation abilities ; and the medium, itself, dries water-clear and is very flexible. Demonstration: Making a jelly medium with this varnish is easy and fast. 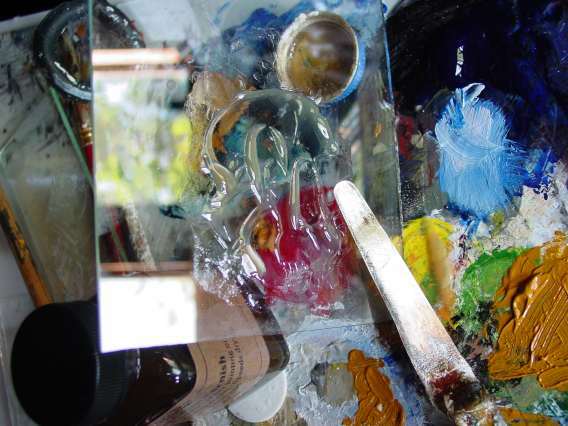 All that is needed is a scrap piece of glass (about 4"x4"), a palette knife, and your own preferred painting oil. 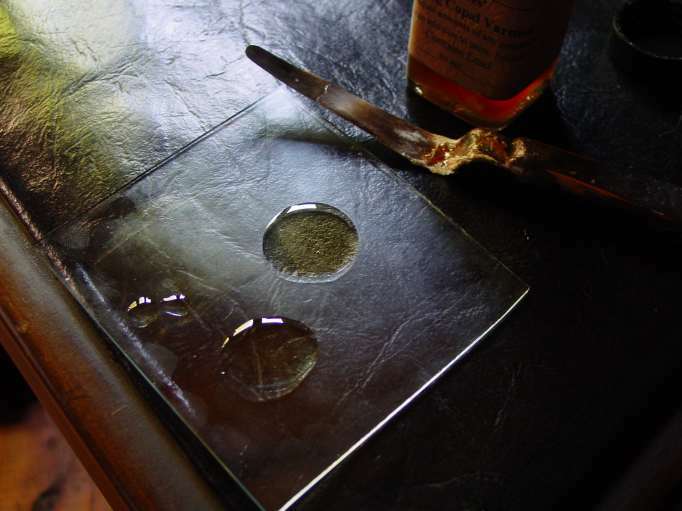 Put approximately equal amounts (exact amounts are not critical to performance) of the copal varnish and the raw oil upon the glass and mix well with the knife. 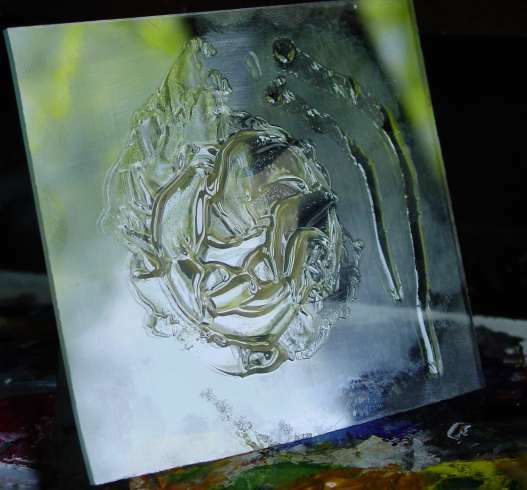 A soft translucent thixotropic "jelly" is immediately created which performs absolute wonders with oil paints-- either comercial tube paints, or handmade. Mixed with the paint, a super-slick media is created that stands at attention, blends easily, and is typically dry and awaiting the next day's session-- allowing layering to be performed with safety. Facility is exceptionable; for example, thin lines or tree-branches can be painted without neeed to oil-out the area beforehand ; and there will be no diffusion afterwards. With use, the 80 mil. bottle of varnish will make at least 160 mil. of medium; and more if the painter finds preference towards a softer, thinner jelly. Raw oil on the left, varnish on the right. Mix and swirl the two liquids together and the jelly forms immediately. The copal jelly is ready for use with the paint. Note the two drops of oil that were not mixed with the varnish. Each droplet runs with gravity while the much-thicker gel remains steadfast. In use, the jelly matter is like a liquid glass, in that it suspends the pigments and dries water-clear. 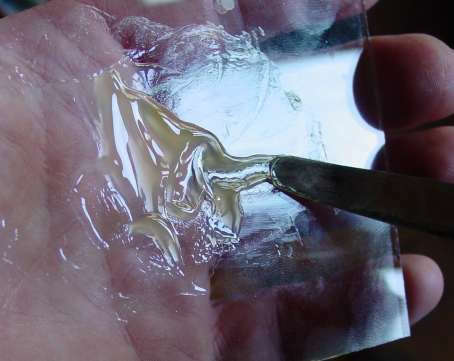 The following image shows the fully-dried and solidified "copal jelly" created on a small sample piece of regular glass. Notice the jelly remained perfectly upstanding through the drying process and with no wrinkling. The marks of the palette knife-tip are clearly recorded. Oil painters have always loved the use of jelly mediums. There are many who believe the most useful mediums of all are those that are gels. The reasoning is not difficult to follow. Gel your paint and all manner of executions/manipulations are handled with ease, that is, when compared to common oils that spread and behave according to gravity and their own physical attributes/limitations. This is why thixotropic gel mediums attract those of us who push paint. Apply the jelly upon a vertical support and there is no running nor dripping. The oil paint, from the thickest impasto to the thinned-down and richest of glazes, stays where it's placed. In short, every execution comes off wonderfully. Many painting experts today say all one needs is perhaps some oil and a solvent combined with a decent tube paint to create just about anything imaginable with that paint. In fact, some get along fine even without the solvent added. Every painter should be happy with their materials. And if you are one who is happy with your materials and technique, there is no real need to read further. Oil paint is not the tough creature that we might think. Raw oil as a binder is rather weak. It will remain a gummy film for many, many years until it completely evaporates away. The oil binder may also be weakened by some pigments it's mixed with. For example, any iron oxide red can attract water to the dried paint film (somehow, the pigment 'likes' water). That characteristic can lead to early paint-film failure. In any such case, the less hydroscopic the binder, the better the guard against this phenomena. A small amount of any oil/resin varnish will help to minimize the bad trait. The copal jelly medium made with the GCV is quite similar in appearance and painting character to that controversial medium known as Megilp ( more info, see "Megilp" on our mediums page). 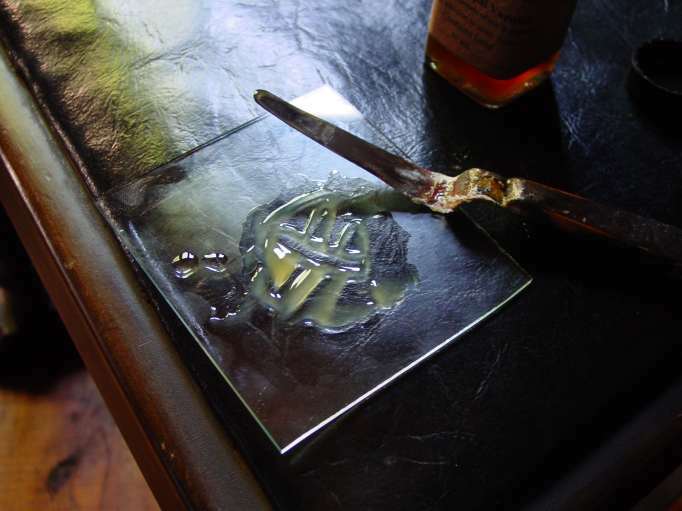 Megilp was/is usually made by simply mixing some leaded oil (known 'back then' as "drying oil", but today as "black oil") with some strong mastic spirit varnish. The result was/is, within minutes, a soft jelly that enabled more manipulation with oil paint while it reduced tendencies towards running or spreading ; also, the mastic jelly allowed especial facility with the brush and faster-drying. Megilp held high favor with many painters in the mid-1600's and on up through the1800's ; but some painters had troubles with its use. It was said to darken and wrinkle the work-- either everywhere or in passages. Having studied the product through many years, I now believe these problems had much more to do with over-use in too many paint-layerings of the jelly medium, especially with those recipes based on linseed oil. In other words, my best guess is this medium is safest if made using walnut oil instead of linseed; and if the work is painted essentially alla prima, that is to say, working up to basic completion one section at a time atop a careful underdrawing, as Sir David Wilkie did when he painted his still splendidly-conditioned "Blind Fiddler" in 1806. It is well-known that Wilkie used megilp as his painting medium for this fine work. Despite its long popularity among painters, megilp is not always the wonderfully seductive creature beneath the brush. Many painters using this legendary jelly medium (AKA "Maroger Medium") complain about the too-fast-settting time, which, as soon as the solvent flashes away from the paint-mix-- usually within an hour-- engenders a sluggishness to their paint and brushing/blending manipulations-- as well as producing a sticky and too-high-gloss finish at completion. 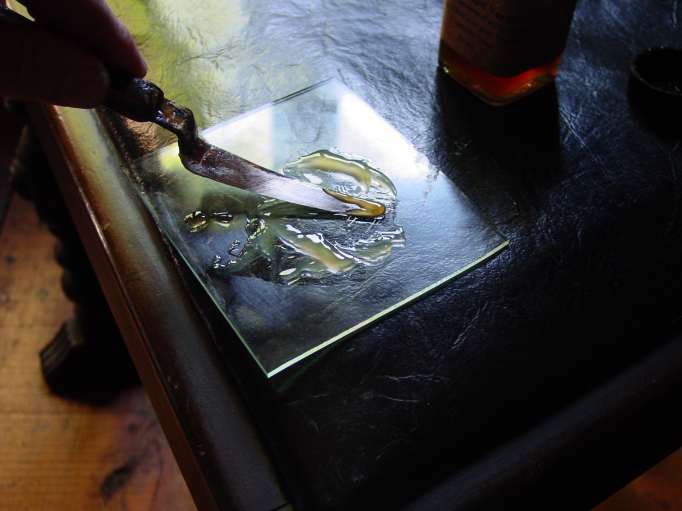 These characteristics are not encountered with the jellies made using our Gelling Copal Varnish, which supplies about an 8-hour free-working window before stiffening; as well as a final soft sheen at drying. 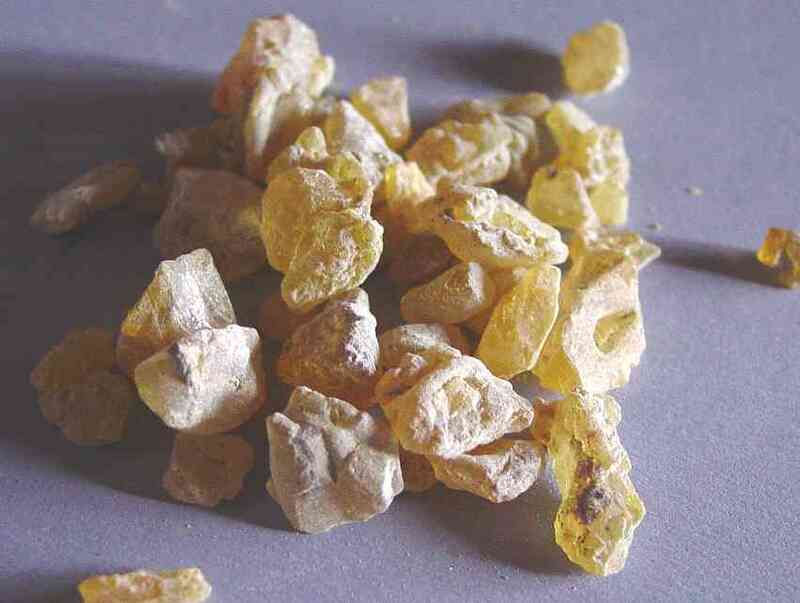 Now about copal: I provide much info regarding this resin within the product-report for "19th Century Copal Varnish" listed on our mediums page. Copal was almost certainly no stranger to the artists before the 19th Century. Every household had some oil varnish on hand for daily-use with the various needs of life. I understand some even used it as a medicine, either drinking it or applying as coverage much as we do today with petroleum jelly. To think a practicing painter would not chance to try this on-hand varnish with his oil colors is, well, not in character with any artist deserving of the name (artists will try anything at least once....and, of course, some manuscripts dating from way back to the 1400's do mention tempering the oil colors with varnish before use). There were many resins utilized in early varnish-making ; and good, tough copal must surely have been one such. 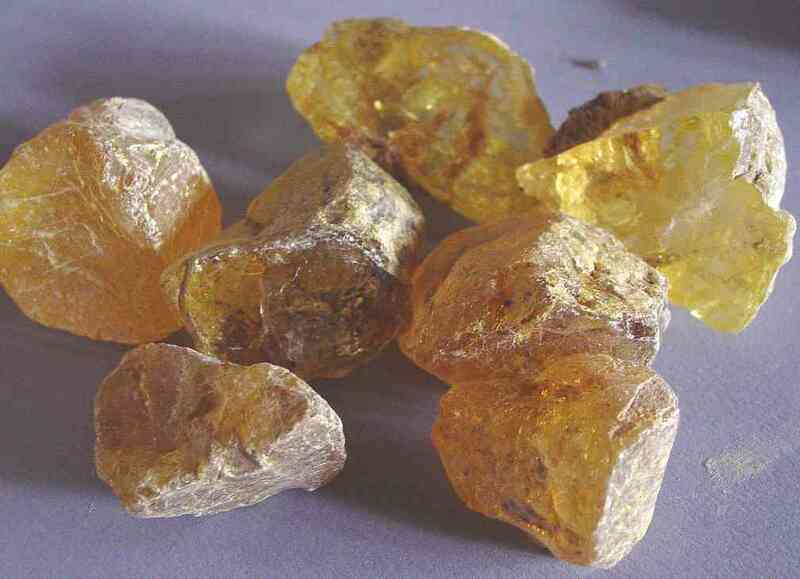 Essentially, there were three types of copal available to oil painting throughout the last 600 years. Burseracia, Auracaria Agathis, and Leguminosae-Hymenaea. It is a given that we painters will desire the hardest and brightest copals with which to make our varnishes. 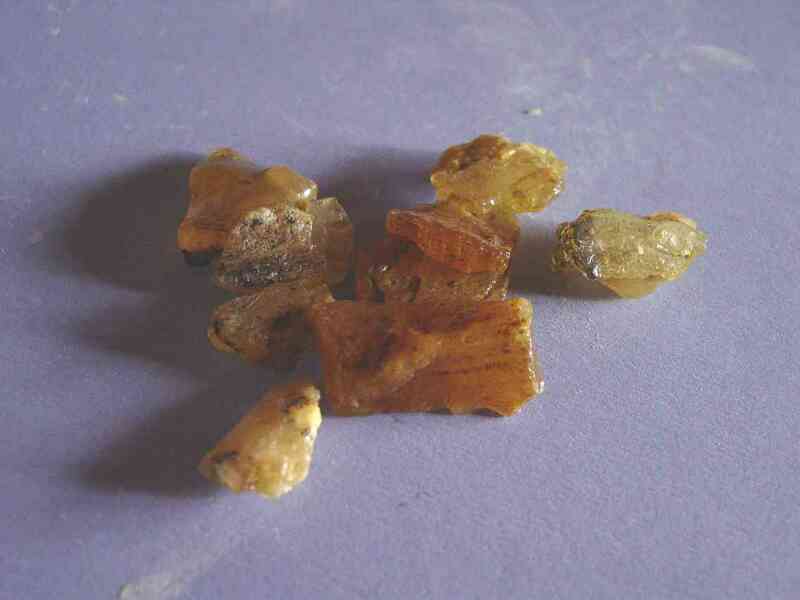 That granted, the first type of copal can be made into a varnish rather easily, as it can often be dissolved in nothing more than turpentine. 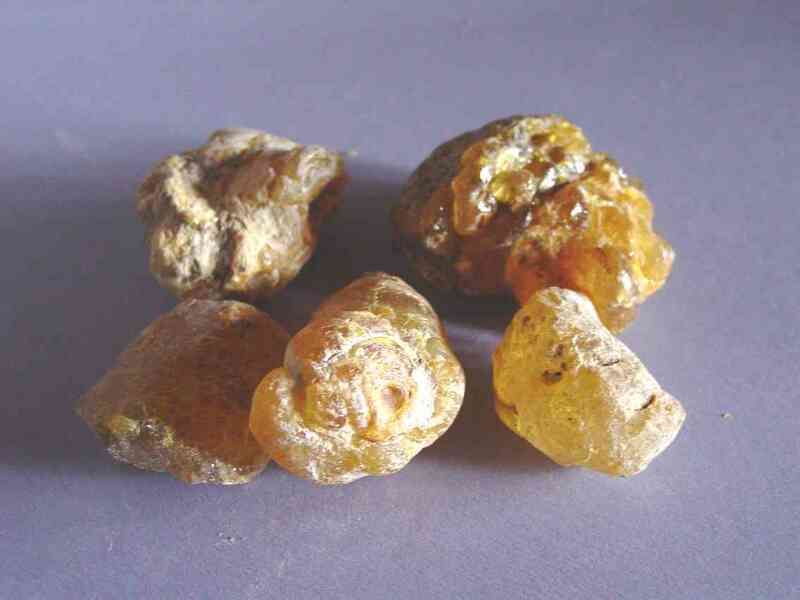 Variously known as copal, I should mention this type of resin is more correctly known as gum elemi. 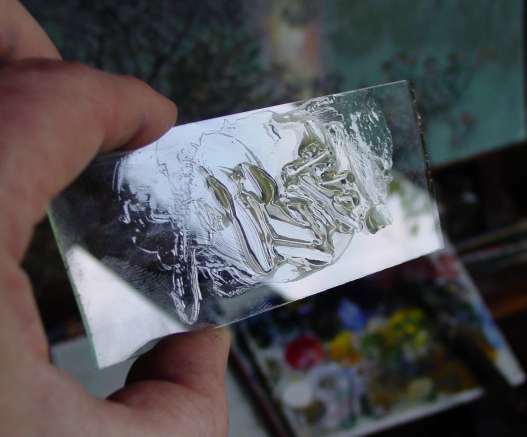 Because of its ease in turp-solvency plus very light appearance, Berserus-type copals were a common choice for easily-made light and clear copal picture varnishes in the last century. As noted elsewhere within this site and this report, the known-use of copal varnishes within 19th Century oil painting technique produced certain desirable effects with the paint and its manipulative accents. Importantly, this use of copal has caused no harm and apparently allowed a certain bump in optical effects-- as well as maintaining excellent longevity to the works. While it is true there are very few findings of any copal varnishes in the old works-- the 19th C. included -- know that, until very recently, there were no analysis techniques capable of actually detecting the high-temperature-made oil varnishes. This was the surprising finding when some mindfull researchers at the Canadian Conservation Institute actually constructed a true copal oil varnish then put it to the test with their state-of-the-art GCMS analysis technique. The result: no copal 'fingerprints' showed. Apparently, the high temperature involved during construction of the varnish destroyed the copal resin's markers. And so it seems all those past scientific findings maintaining the old masters never used anything more than oil and pigment are based on tests not actually capable of detecting oil varnishes. 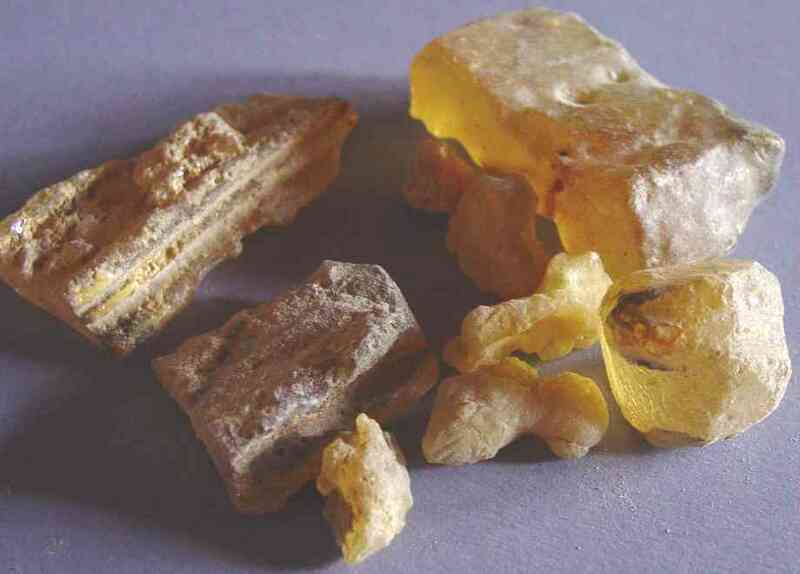 As noted, copal has been an ingredient in megilp for well over a hundred years. As with all these "copal megilps", the aforementioned Roberson's Medium utilized mastic as the gelling agent and copal varnish as the fortifier. But it seems no one has been able to get a pure copal-and-oil-only varnish to gel oil of and by itself; that is, alone, without the need for mastic or other gelling agent. And so, it would appear that, historically, there were no known pure copal jellies available-- at least on a commercial basis; and, interestingly, this long-sought goal/idea, i.e., that a gel could be produced using only copal and oil, is still regarded as impossible-- leastways so in the minds of the Tate Gallery conservators. Well, in any case-- and regardless the historic and contemporary unsuccessful trials to obtain it-- we've now produced the unique and long-sought genuine article. There truly is such a thing. Our unique Gelling Copal Varnish produces a thixotropic jelly when mixed with oil. The actual gelling is produced by the copal ingredient; and not by some other gelling agent. How far back in history can we trace the recorded use of a gelling medium by oil painters? Rather far. Sometime around the year 1680, while visiting Italy, an Englishman named Henry Tilson came into contact with one Sebastiano "Basha" Bombelli. Bombelli was a portrait painter of high regard in his day. Tilson noticed Bombelli working away with an odd white jelly, especially noting that Bombelli tempered all his colors with the stuff, utilized it in his first and second layers; and then finally as a glazing and veiling agent to finish off the work. Tilson inquired about the medium and was told the jelly came from Bombelli's own color-maker. Bombelli claimed the medium kept his colors from sinking-- a valuable trait. Tilson found it remarkable in the way it helped the flesh in B's portraits. The well-known portrait painter was even helpful to the point of giving a general direction for making the jelly. It turned out to be a cooked combination of mastic gum, walnut oil, peter oyl, and litharge. But there were other jelly mediums before megilp. How can I know? 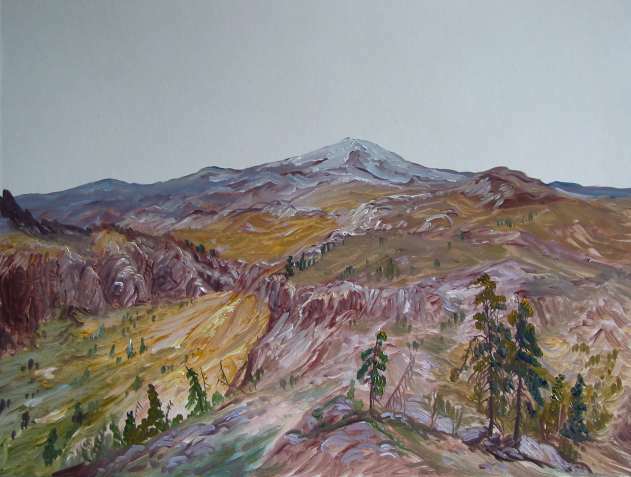 I have eyes and a lengthy background in oil painting ; and it is not a difficult thing to see, really. Did you ever notice those very oily-looking juicy passages in, say, Frans Hals' clever works? There are delicious-looking passages that should have dripped down the panel or canvas ; and yet there they set, as if cast in a liquid glass. Charles Eastlake noticed brush-marks in the liquid glazes on some early 1500's Italian paintings he'd examined. He wondered if the Italians had some secret media similar to megilp to allow such freedom and paint-wizardry. On page 56 in the 2nd volume of his masterwork, "Methods and Materials...", Eastlake wrote: "...On the other hand, in pictures where the shadows are painted with much vehicle, the marks of the brush are sometimes visible in the transparent mass." Eastlake adds: "Whether the older painters had any other special means of arresting the flow of the colour in the cases referred to may be a question : the advantage of meguilp in this respect will always render it a favorite vehicle, notwithstanding its defects; but there is no evidence whatever that the old masters used it." Of course, the oil painting experts of today caution us not to add much media to our paint; and yet we can readily see the older guys' pigments were often and seemingly swimming in the glassy sauce. How so could they get away with such things while we of today cannot? It is such simple observations as these that engender the thoughtful eye and mind to seek the "Holy Grail" of oil painting media. [Note: I have read lately of a "newfound" theory allowing that finely-pulverized glass is surely the means to the brilliant optical effects attained by the golden age masters. This is not possible. The simple reason is, powdering glass to a pigment will effectively produce a pale translucent white paint when combined with an oil or other paint -- in overall effect, no better than pigment-grade chalk ; and this white ingredient, were it contained within every color and non color, would, as strong example, effectively destroy the deepest darks so characteristic to the olden paintings. What I mean is, mixing such powdered glass with a black paint, for instance, would produce a dark grey, instead of a black. And adding some of this powder to brilliant light colors will actually dull their saturation. The apparent real reason for this glass powder showing up in the old paint chips-samples is simply explained by the period manuscripts which mention adding pulverized glass to paints as a drying agent -- the glass used containing lead or other metal-- which did and does, effectively, speed the drying of the paint. There is another plausible rationale: that of the period color shops also cattering to ceramic and pottery craftsmen, who desired glass as an additive to the pigments so that they could create glazes for their fired wares. I can easily imagine some poorer painters asking for the adulterated colors on occasion to save a coin ...perhaps even the color-shop man selling the adulterated stuff unbeknownst. But yes, indeed, one can see the very effects of a jelly media still standing in some of the olden works. Was it some form of mastic megilp ...or was it something else? I have constructed some few varnishes that possess this gelling effect when added to oils. And I firmly believe that if I can find these curious concoctions, those who arrived on this planet well before me could very likely have done the same. It is my further belief that just about any decent natural resin can be used to create such a gelling varnish. It is plausible some few of these constructs might deliver valuable traits to oil painting. I'm thinking a fine copal varnish just might be the very critter to match the need. The Following small study is performed on glue-sealed heavy paperboard. In this example, no solvents were utilized (though I often do make good use of such agents). This scene represents an imaginary foothills composition undertaken in the grand landscape -- Hudson River style-- manner and technique. 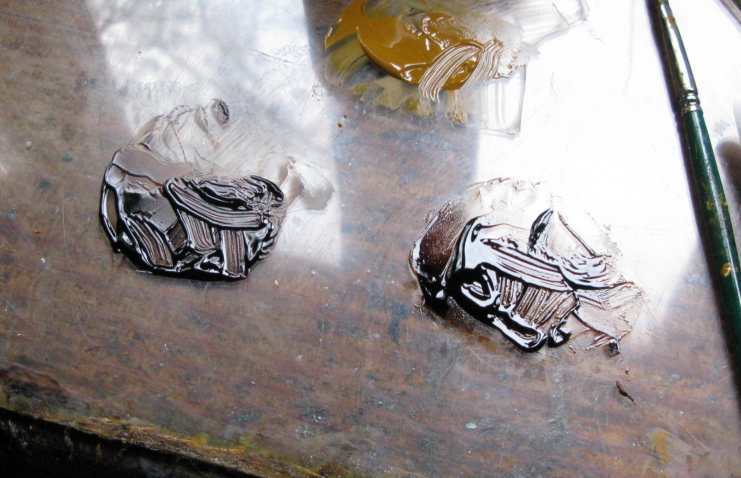 The first image shows the quickly scrubbed-in multichrome using YO, ULT, IR (iron red), with some white added to each color; and the basic brown seen throughout is lampblack+IR+White. My white is 75% lead white and 25% zinc oxide. All my paints are made by myself using pigment and raw unrefined walnut oil, rubbed together to a heavy stiff-cream consistency. Afterwards, lots of copal jelly is used in the handmade paint -- about 50-100% to bring it to a soft supple richness. I also oil-out the sealed dry ground with the copal jelly. My brushes are small soft Taklon flats and filberts, nothing over 1/2 inch-- sable and minever would be the original brushes for this sort of work. Though the paint is juicy, due to the jelly it is also steadfast in character. I often grab more jelly with the brush to mix with the tints as I worked. The effect is one of solidity with transparency combined. Everything keeps its place beautifully and allows going back over and refining while wet, either 'building' paint, or jotting and pushing/pulling with the various brushes. The final scene measures 14"x18" and took approximately 2-1/2 hours (and a tea break) to complete. Oh, I did add a few touches of cad yellow + white in the more sun-lit area, left of center. As is my usual practice, the sky was left bare at this session-- simply the white paper ground left showing. Next morning, everything was dry; I added some ult+white sky-color and clouds; plus some snow to that mountain in the distance. Also scumbled some very thin cloud-shadow color over the distant hills to make them recede. The jelly medium allowed everything with ease. Two days later I sat down with fresh paint (same colors) and brushed on a thin coating of jelly to some areas. I then worked into the jelly, heightening color a bit and adding detail atop the dried underpainting. Realism built everywhere I worked. This final shot was taken out doors for truest color. When it comes to the final glazing/veiling/ heightening layer, I will typically go medium-heavy. Some might get squeamish reading this, as it also goes directly against what is being preached today to young painters. Yet, in reality-- which is the realm we must live in-- this medium-rich method works perfectly. You see, what happens is this: much of my medium will necessarily sink into the previous layers. It's true; and so I give my last layers a strong dose of medium which allows the work-- after this sinking effect occurs -- to retain and exhibit a pleasing sheen; and also possess the optical richness and lasting durability which my strong medium allows. 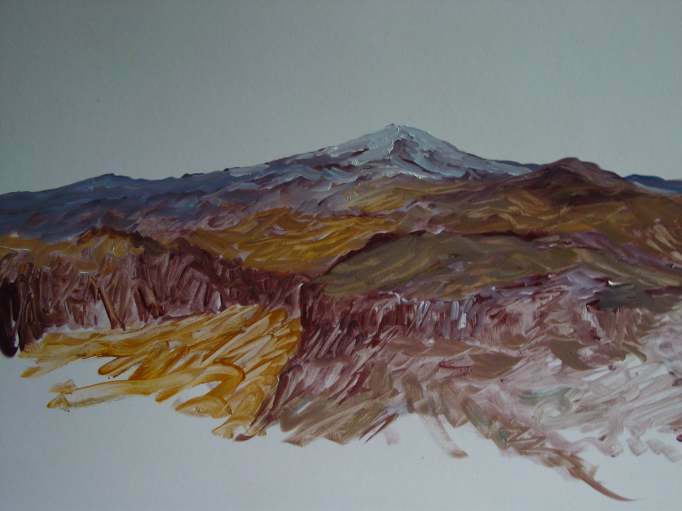 Were I instead to take the advice of the current oil paint guru's and have used "pure", or "pigment-rich" paint, and worked a thin layer of that starving creature over and atop my underpaint, the suction of the lower layer would then steal the scant oil within that thinned out glaze/scumble. Understand, such a glaze/scumble will have no real lasting strength; nor will it appear rich in optical effect; for it is, in reality, little more than powder brushed out atop your painting. Even the simple act of varnishing it some months 'down the road' will lift such poorly-bound glazes/veils. BTW, in no way does this weakly-bound 'powder-application' match the old master painting term known as 'glazing'-- literally meaning a layer of glass-like paint. As with all our unique products, Gelling Copal Varnish comes with an instruction sheet to help with use. Click here to see my entry on asphaltum oil paint.